BUFORD, Ga. (Aug. 2014) –The Buford Corn Maze is set to begin its 2014 season Saturday, Aug. 30 at the five-acre site on Friendship Road in Buford. The maze, which attracts approximately 20,000 visitors each year, is open through Nov. 16 with activities on Fridays, Saturdays and Sundays through September then expanding to Mondays and Wednesdays in October. 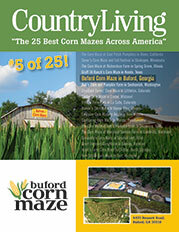 There is more to do at the Buford Corn Maze than just finding your way through the five-acre maze. The attraction features Atlanta’s longest hayride. The mile long trail wind around the maze and through the forested area on the property then back through the Haunted Forest. There is also a corn box play area, face painting, pony rides, a bounce house and farm animals to pet. And in late September, October and November, the Buford Corn Maze’s Haunted Forest comes to life for Halloween. Live music is presented on some Fridays and Saturdays, and visitors also get a chance to sing on Sundays with karaoke. “We see a lot of the same families and groups coming back year after year, and we are attracting new ones as well. We’re really excited about the coming season,” Beggs said. Times vary throughout the season. The times for Aug. 30-Sept. 14 are Fridays 6-10 p.m., Saturdays 10 a.m.-10 p.m., and Sundays noon-10 p.m. The Haunted Forest opens on Friday, Sept. 19 and the hours are Fridays 6 p.m.-midnight, Saturdays 10 a.m.-midnight and Sundays noon-10 p.m. In October, the hours expand to week Mondays 10 a.m.- 7 p.m., Wednesdays 10 a.m.-7 p.m. and Fridays 10 a.m.-midnight. The rates are $14 for the maze, with a reduced rate of $10 from 10 a.m.-4 p.m. Mondays through Thursdays in October. The Haunted Forest costs $14, and a combo ticket for the maze and the Haunted Forest is $22. The group rate is $12 per person with a minimum of 20 people. Located on Friendship Road in south Hall County, the Buford Corn Maze is a seasonal family attraction with activities for the entire family. Open from September to November, the Buford Corn Maze features a five-acre corn maze, hayrides, Haunted Forest, along with a corn box play area, face painting, pony rides, bounce house and farm animals. Entering its sixth season, the Buford Corn Maze has attracted approximately 20,000 visitors each year. The Buford Corn Maze is available for special events. For more information, visit www.BufordCornMaze.com.